There is a lot going on here…panels…materials…but it all comes together like a well rehearsed choir. Orange seems to be the new black, and these gloves have been a staple in my kit through winter till now. After using them for pretty much every MTB (and gravel bike ride) that did not call for a cold weather glove, I think these are possibly the best gloves I have used in quite some time. Here is why. It would seem that a glove is a simple thing to do right. But my experience says otherwise. In the past, most gloves do things such as: Fingers are too short and bind when the hand is closed. Seams annoy. Cuffs are too tight to get into. Sweat and strain tear at the material and stitching. No nose wipey section. Big, long, wipey sections. Bravo. 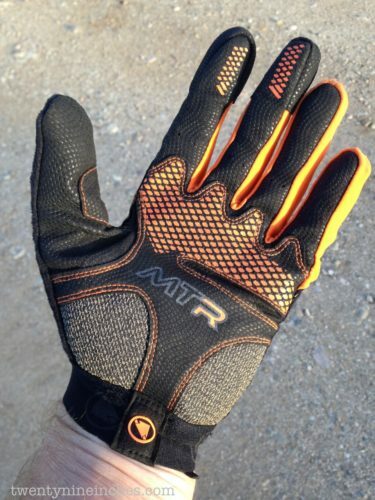 The MTR full fingered glove passes all the key points. They are only slightly difficult to get into, since the cuff is stretch with no strap to release the opening, but they are never so hard to get into that you start lining up cusswords for imminent use. And once in them, they do not pinch or annoy at the wrist. The thumb and fingers are plenty long and do not press at the fingernails when gripping the bars or in the webbing area at the thumb/pointy finger junction. They have some palm padding, but not too much. They look and feel feel rugged enough to survive dirt sampling (and they have) but wear/fit like they are a lightweight glove. They have a long Terrycloth wipe section for snorky noses or sweaty brows. They are also a bit of an in-between glove for temperature ranges. I used them often on colder days as a warm-up/climbing glove and swapped into colder weather gloves when the DG began. But on their own, they do well in cooler situations and warm days too. However, they might be a bit hot for sticky summer days. I have had gloves that felt more ethereal in hot weather (but did not last either). 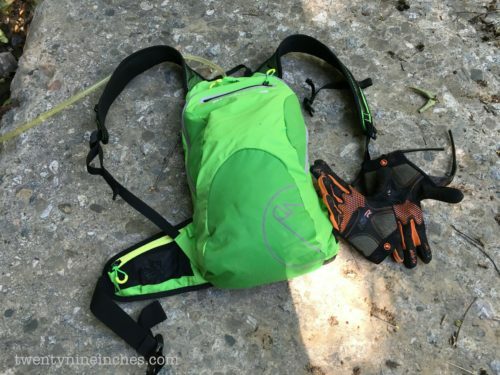 Yes, look for an upcoming review of one of the new hydration packs from Endura. 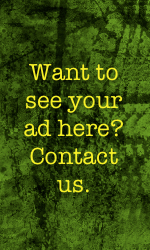 It’s very green. Honestly, taken as a whole, they are simply well done and show no wear after multiple rides and several hand and machine washings. 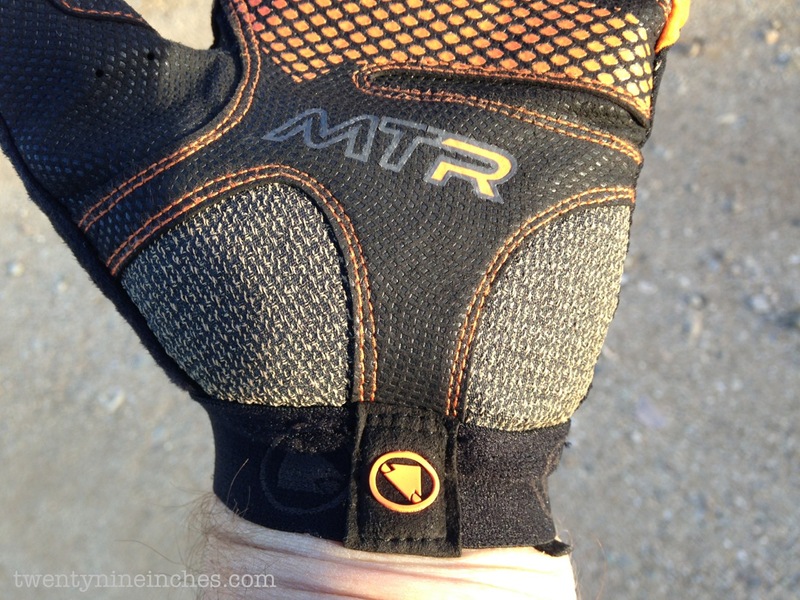 The MTR full fingered glove from Endura is a fine example of getting simple things right. I have used them for gravel and bikepacking trips too. 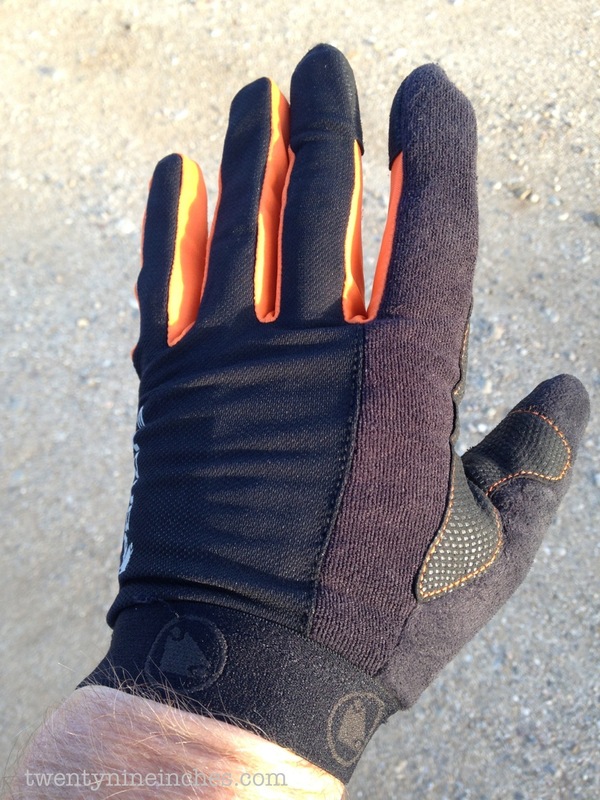 Note: The gloves shown here were provided at no cost to Twenty Nine Inches for test and review. We are not being paid, nor bribed for these reviews and we will strive to give our honest thoughts and opinions throughout. 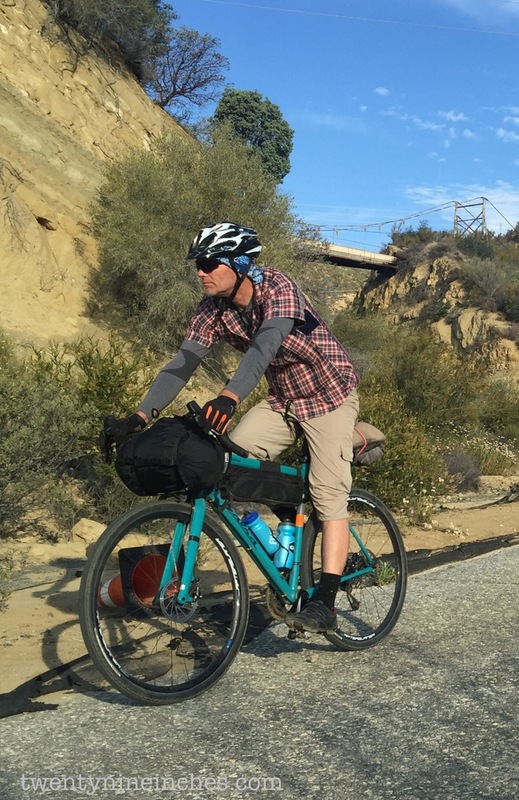 I use endure singletrack II gloves. Much bigger palm heel pad which I like cause it prevents blood flow issues unpadded glove bring me. Same elastic wrist fit. They fit really well and seem to be wearing really well too.